Did you come to one of our past walking festivals? We hope you enjoyed our walks and we are looking forward to seeing you for our next events. They are always on the first May Bank Holiday. In the meantime, look at the pictures we took, you might recognise yourself! If you joined us in the past, why not leave us a comment? A sweltering hot second outdoor festival! Did you noticed the weather last year? I mean, was it just me or it’s been quite an exceptional year! English weather doesn’t usually prepare you for so much sunshine. It’s a funny thing in a way because Summer officially starts on the Summer Solstice which was 21st June 2018 that year. 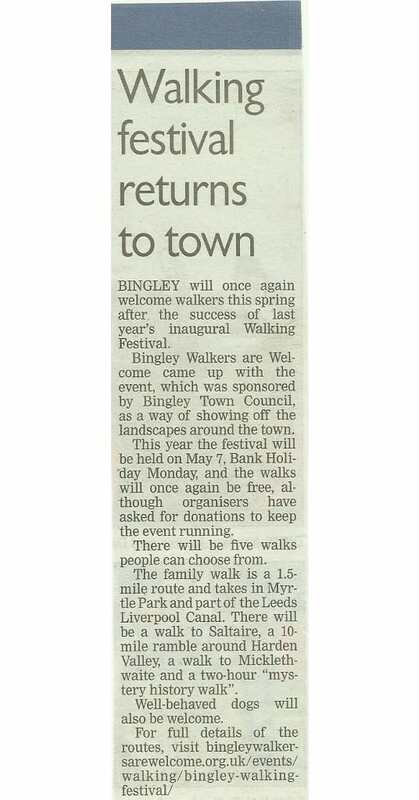 However, we had a fantastic Spring and Bingley Walkers are Welcome were able to make the most of it. Ready to go on the long walk! What a success for our first outdoor festival! Today we can be very proud of ourselves. Our first ever outdoor festival is now finished and what a day we had! 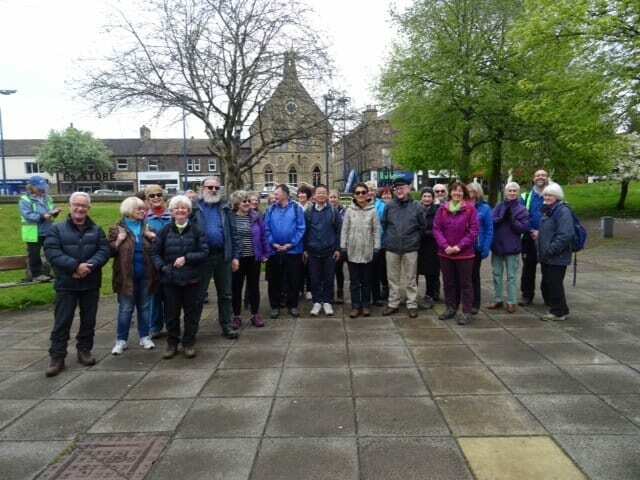 More than 150 people turned out on four different walks during our Bingley Walking Festival on Bank Holiday Monday May 1st. A week before, on 25th April, we held our second AGM and we successfully recruited four new committee members. Back in March, we also recruited six more walk leaders after they went on a special training course. Another course this month will see two more walk leaders fully trained. 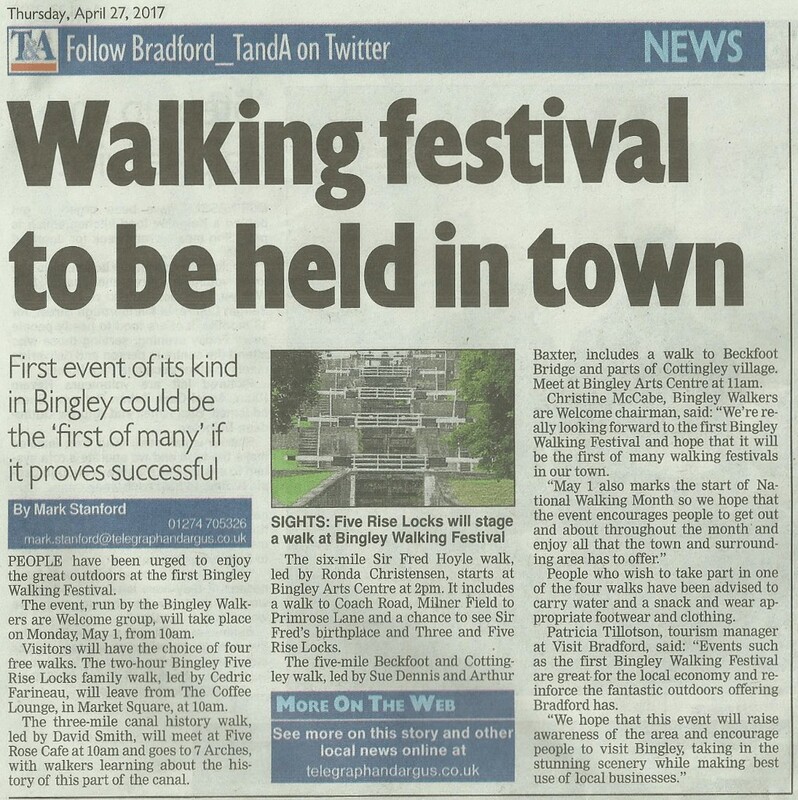 This will mean we have 11 fully trained walk leaders in our group. All of this is proof that people in Bingley have a passion for walking and the great outdoors. This is so encouraging and we are all looking forward to organising our second walking festival in 2018! 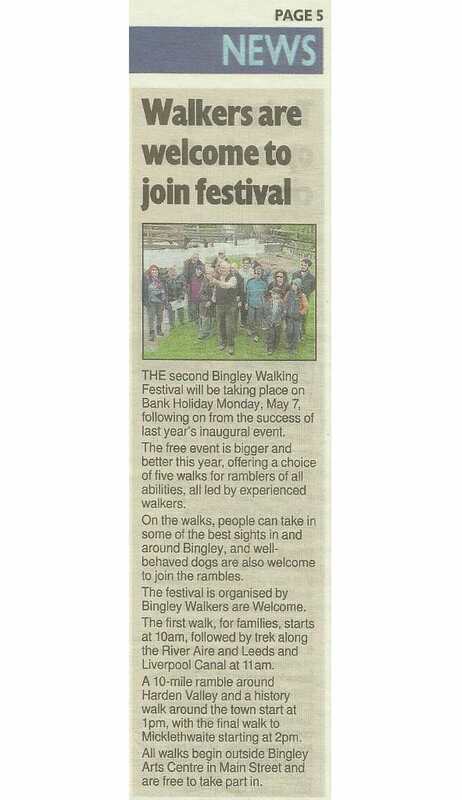 The outdoor festival was a great occasion for every participant to discover or rediscover various parts of Bingley. Local businesses also benefited from the extra customs the festival brought in town for the day. However, none of this could have happened without the help and support of various people and organisations. 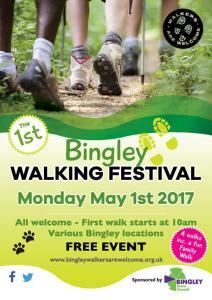 First of all, Bingley Town Council gave us a grant of £500 which was used to design and print our leaflets and posters for the festival. This was a necessary step to get noticed by the local community. We soon realised it could be a success when we had to re-print a new batch because all the flyers were gone! A special thank you goes to Emma Gregg at Fullstop Studio who designed the attractive leaflets and posters. 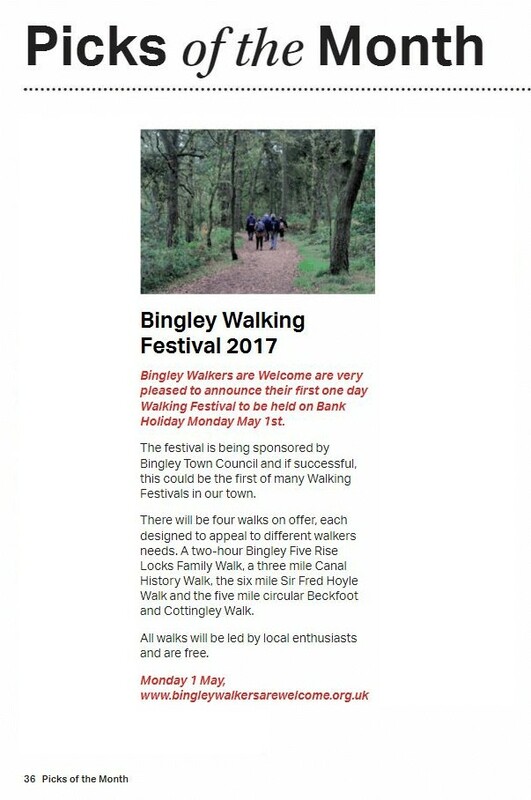 Note: the grant was also awarded on condition that we would produce a special leaflet dedicated to walks about Sir Fred Hoyle early life in Bingley and surrounding areas. Then of course our walk leaders and backmarkers who gave their time to prepare and lead the walks during the festival. Safety on all walks is very important to us and having both walk leaders and backmarkers gave reassurance to all walkers that we would take care of them no matter what. Canal & River Trust also supported us and sent us some “Quack Snacks" pouches which we filled with porridge oats for the Bingley Five Rise Locks Family Walk. This was a great occasion to make children and grown-ups aware about what food should be given to ducks. Each year, tonnes of bread are thrown away in our canals and unfortunately it’s a real misery for both animals and habitats. The Trust is trying to change this and launched a great campaign about it. Have you seen their video yet?